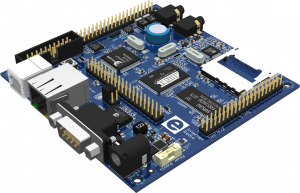 Although intended as an Internet radio, this ready-to-use platform is well suited for general hardware and software projects. With its ARM7 CPU and low current consumption, the Elektor Internet radio offers various expandabilities. Programming is carried out either via USB or JTAG. 32-bit single board computer with huge amounts of memory for streaming media applications. VS1053 audio codec for Ogg Vorbis, MP3, AAC etc.